Joint Task Force-Bravo has been a consistent presence in the Central American region since 1984, and is known by many for its helicopter support for humanitarian aid, disaster relief and counter-transnational organized crime operations and its medical readiness exercises; however, the scope of capabilities here go well beyond those primary missions. One example of this is the Joint Security Forces’ Military Working Dogs and handlers. The MWDs are used by JSF on base for narcotics and explosive detection as well as patrol, explained U.S. Army Staff Sgt. Isaac Trevino, JSF MWD senior handler. As with many military duties, there are risks involved that in a worst-case-scenario might require rapid medical evacuation, a capability provided here by the 1st Battalion, 228th Aviation Regiment’s U.S. Air Ambulance Detachment Honduras. A number of steps are taken by the aircrew and MWD handlers to be prepared to conduct MEDEVAC operations at a moment’s notice, one step being to introduce the MWDs to rotary wing transportation including loading and unloading both with the helicopter on the ground and in the air. Aircrew from the 1-228 AVN provided hoist training for Kyra, Jaska and Puma, three JSF MWDs, and their handlers, U.S. Army Spcs. Mariah Ridge, Courtney Moreland and Harley Reno, August 15, here. The training, accomplished using a UH-60L Black Hawk, was conducted in phases in order to allow the MWDs to become familiar with the noise and rotor wash, sitting in the aircraft, the feeling of being wrapped in the harness and, finally, being lifted 30-feet into the hovering aircraft. 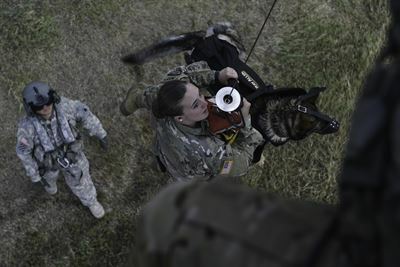 Though K9 hoist training is routine, it presents a unique opportunity for MWD handlers who are deployed to Soto Cano AB. JSF conducts Law Enforcement and Security Operations for JTF-Bravo personnel and equipment anywhere within the CENTAM AOR. JSF is composed of joint personnel who patrol the base and provide expeditionary force protection in support of JTF-Bravo operations such as MEDRETEs and humanitarian aid events.